This product has been replaced by the Super Chief Xtra 5 Amp Duplex Radio Equipped (SCFXD) and is no longer available. Click here to view the SCFXD. 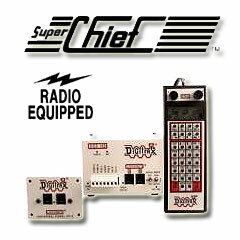 The Super Chief starter set contained a DCS100 command station, a DT400R throttle, a UR91 Radio Receiver, and a LT1 LocoNet tester. This Starter Set was equipped with Simplex Radio. Simplex Radio is no longer offered in Starter Sets after Super Chief Series. Super Chief Xtra sets are offered with Duplex Radio.